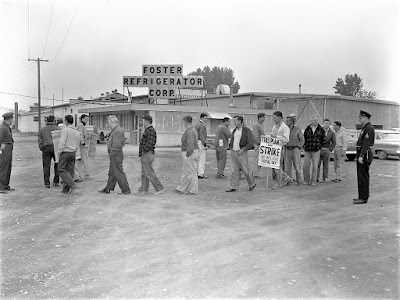 Among the photographs of Howard Gibson made available online by Bruce Bohnsack is this picture showing striking workers in 1960 at the Foster Refrigerator plant at North Second and Dock streets. That was fifty-eight years ago. For the past quarter century, the site of the Foster Refrigerator plant has been an abandoned brownfield. Ownership of the site and responsibility for its remediation somehow devolved to the City of Hudson, and the site has, over the years, been a frequent topic of discussion in City Hall. 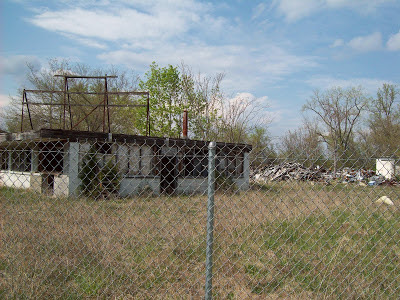 Back in April 2012, after at least five years of talking about a possible use for the site if only it were remediated, then mayor Bill Hallenbeck suggested it as the location for a dog park. It turned out to be an empty gesture offered to those clamoring for a dog park, and within a few days all talk of the site becoming a dog park ceased. Cleaning up the site would be no easy task. About 2,600 cubic yards of lead-contaminated subsurface soil and 100 cubic yards of PCB-contaminated soil had been found on the site, and the remediation was expected to cost more than $1 million. Fast forward to today. The Department of Environmental Conservation (DEC) has been working on the cleanup of the site for more than a year. In the past couple of weeks, approval was given to start carting away the contaminated soil, and that process is now underway. When all the contaminated soil has been hauled away, a one-foot layer of new soil will be spread over the site, and grass will be planted. Going forward, DEC will continue to monitor the site (it is within the 100-foot buffer of a wetland) and will dictate how the site can be used. Last night at the Public Works and Parks Committee meeting, DPW superintendent Rob Perry predicted that the site will not be ready for any use until summer. The question is: What will happen then? Situating industrial and commercial properties next to waterways is an antiquated concept stemming from a time when streams and rivers were used as industrial sewers and garbage cans. It's not a good location for that, also not a good location for residential use for obvious reasons. Land adjacent to waterways should be rezoned to prohibit industrial use. The best use would be for some sort of park, or nothing at all, which would not mean it is not "used", it will certainly be made use of by the many plants, birds and animals that will quickly take up residence there. To me it seems the view many people have, when observing any open land, to imagine what human development can be placed there, is a limited, anthropocentric one. A piece of land is not "unused" just because humans are not manipulating it. A good human use might be to use the site as a bio-nature laboratory and bring the school kids down to observe the reclamation of nature. Species of plants and animals could be documented as they arrive and change over time. Kids could learn about ecosystems, the history of the property and the harm that results from pollution.